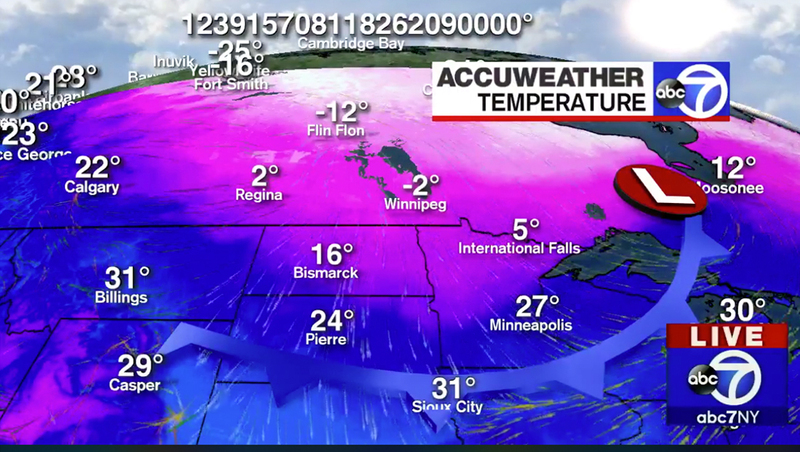 A WABC weather map erroneously reported that it would be 123,915,708,118,262,090,000 degrees in a place called Cambridge Bay, Canada, according to s screen capture of a weather map used during a Facebook Live update hosted by Lee Goldberg Tuesday, Jan. 15, 2019. A quintillion, by the way, is 10¹⁸. Not only is the number obviously an impossible measurement for earth, but the real weather is actually completely in the opposite direction. A nearby city named Fort Smith is listed as having -16 degrees, while another locale, whose name is obscured by another number, is listed at -25 degrees.